Front fences and Dividers are designed to prevent merchandise and goods from falling off of the front or rear of a lower or upper gondola shelf. 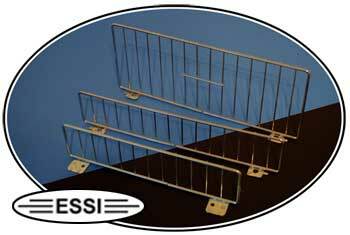 All wire shelf fences available for most shelf manufactured with a chrome zinc type finish. Available in a 25 pack with affordable shipping. Front fences connect to shelves n perforations located in the front and rear of shelves. Compatible with Madix standard upper shelves and base shelves. Compatible with Lozier standard upper shelves and base shelves. Gondola Shelf Dividers are designed to help prevent store merchandise or goods from falling off of the sides of upper and lower gondola shelving. Dividers can also be configured into a bin type system that can help categorize small or lard items. The solution for maintaining separation of school, office and art supplies. Dividers are 3 3/4" wide x 7 3/4" high x 6 3/4" deep. The dividers clip into front shelf perforations. Minimum product width is 6". 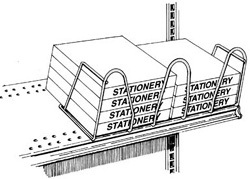 End dividers are sold in pairs. Multi-Purpose Gondola Shelf Dividers are perfect for stationery items and packaged goods or any merchandise you want to keep organized. These dividers are specifically designed to boost product visibility and accessibility. Tension fit multi-purpose dividers attach without hardware and provide fast and easy reset of shelf. The Wire Multipurpose Divider is used for separating items such as office supplies. It hooks into the perforations of the Standard Upper Shelf. The bends in the front of the dividers serve to secure the product. No front is needed.